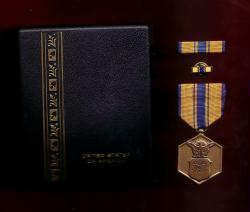 USAF Commendaton medal decoration set with medal, ribbon bar and lapel pin in case. 1. Description: (Front) The medal is a bronze hexagon (one point up) one and three-eighths inches wide with a raised border. The medal is finished in a light brown patina. In the center is the Air Force Coat of Arms. Above the Coat of Arms is an eagle with its wings displayed so that its wingtips are in front of the raised border. Behind the eagle is a cloud formation. (Reverse Side) In the same hexagon and towards the bottom of the medal, a plaque for inscribing the recipient's name. Above the plaque (in three lines), the inscription FOR MILITARY MERIT in raised letters, with the word MILITARY slightly arched. 2. Ribbon: The ribbon to the Air Force Commendation Medal is predominantly yellow, with its center bisected by a stripe of Air Force Blue. This center stripe is edged in yellow which is followed on both sides by a blue pinstripe. The outer portion of the ribbon is also edged in blue. The yellow and blue were selected because they are the Air Force colors. 3. Criteria: The Air Force Commendation Medal may be awarded to members of the Armed Forces of the United States below the grade of Brigadier General who, while serving in any capacity with the Air Force, distinguish themselves by heroism, outstanding achievement, or by meritorious service not of a sufficient nature to justify a higher award. 4. Components: Additional awards of the Air Force Commendation Medal are denoted by oak leaf clusters. Effective January 11, 1996 the bronze V device may be worn on Commendation Medals awarded for heroic actions that do not qualify for a Bronze Star provided the action occurs during a contingency operation that the Joint Chiefs of Staff has declared as a "hostile environment." Single heroic acts performed during terrorist acts and isolated combat incidents may also qualify, but the device may not be authorized for heroic acts that take place during peacetime. 5. Background: The Air Force Commendation Medal was established by Secretary of the Air Force James H. Douglas, Jr. and promulgated in Air Force General Orders Number 16 of March 28, 1958. The Air Force Commendation Medal was designed and sculpted by Thomas Hudson Jones (1892-1969) of the Army's Institute of Heraldry.